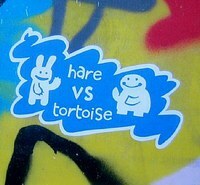 Which kind of blogger are you, a Tortoise are a Hare? We grow up learning the story of these two rivals, and taking away the lesson that slow and methodical overcomes fast and impulsive, but does that lesson apply to blogging as well? Or, more specifically, to all forms of blogging, or just some? I find myself thinking upon this after coming across two blog posts today: one arguing for quick blogging, the other for slow blogging. They both seem to raise valid points, but they also seem to be looking from different perspectives. Amy, the author of the post How to Blog Without the Time Sink, makes some excellent points about blogging for professional development. She recommends using your blog as your “backup brain”, and making it part of your “ongoing process”. I highly recommend reading her post, as it is an excellent framework for how to use a blog for professional development and social networking. So, although I know that the tortoise always wins the race, I think that the hare may have more interesting discussions and make more connections. Also, learning is a path, not a goal, so let the tortoises focus on the finish line. Personally, I don’t think there is one. This was written by Stephen Henneberry. Posted on Thursday, September 20, 2007, at 11:38 pm. Filed under Blogging. Bookmark the permalink. Follow comments here with the RSS feed. Both comments and trackbacks are currently closed. I’m browsing during half time of the rugby world cup. Was interested to read this posting about blogging. I started keeping a blog for my researcher competence module which I’m doing this semester – we have to keep some kind of reflective journal as part of the course, so it seemed the obvious thing to do. But it didn’t seem to work so well if you want to add to certain themes again and again. The linear order in which blog postings are displayed by date order didn’t necessarily fit what I wanted. I’ve recently been using wikis for collaborative writing projects with colleagues, and they’re just great for this. They work well if you want to build on themes rather than build a linear sequence of events, which I felt I wanted to do in my journal. So I’ve switched to using a wiki for my reflective journal rather than a blog, even though it didn’t initially seem the obvious thing to do. You’re such a prolific blog user, I wondered if you’d compared their use in this way before? Great question… There are definite benefits to both, but it sounds like you made the right choice with the wiki. While I think that a blog works great for the reflective part, especially if you are looking for discussion on the topic, a wiki is a great way to keep a more in depth record of information. Blog posts are just not intended to be edited once they are posted. Discussions may ensue in the comments, but the post remains pretty static. On the other hand, a wiki is meant to be updated and refreshed. Why not do a combination of the two? A blog for recording thoughts and starting discussions, and a wiki for compiling and updating your information/conclusions? Hmm… Perhaps I should do a blog post on this to explore the advantages more… Thanks for checking in! Hmnn, both seems like a good combination, I guess that’s what you’ve done here with the Ning site.